We love pets! But we know that pets come with their own set of challenges when moving them into a rental. Our third party pet screening allows owners to feel confident that the pet has been looked at in several areas to ensure the risks are low. They screen based on current vaccinations, general care, behavior, compatibility, breed and more. This screening allows us to have a full view of the risks involved and set reasonable pet rent & fees to protect the owner against potential future damage. RentWise, A Property Management Company, will cover any damages caused to the home, above fair wear and tear, resulting from the approved pet(s) that is not covered by the security deposit will be reimbursed by RentWise, to the owners. This excludes any service animals per Fair Housing Guidelines. Any collection efforts under this provision become the sole responsibility of RentWise. 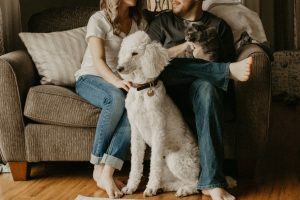 RentWise, A Property Management Company, will cover any damages caused to the home, above fair wear and tear, resulting from the approved pet(s) that is not covered by the security deposit will be reimbursed by RentWise, to the owners. This excludes any service animals per Fair Housing Guidelines. Any collection efforts under this provision become the sole responsibility of RentWise.